“…seemingly inexplicable shooting death…?” How seemingly inexplicable is it when this man oversaw more than 20,000 inmates? 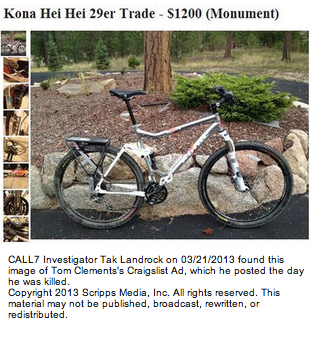 I’d say the suspect(s) could potentially include 20,000 family members or/and friends of the Colorado inmates. Or how about people out on bond, possibly looking at prison time? Or how about the friends/families of inmates denied parole? Or how about the guy who threatened to blow up everything and the kitchen sink if James Holmes wasn’t released? It’s also been mentioned that some of his changes throughout the prison systems may have made him some enemies. “Seemingly inexplicable shooting death…?” Come on. It seems his job would hold innumerable risks. UPDATE: No suspect has been found. 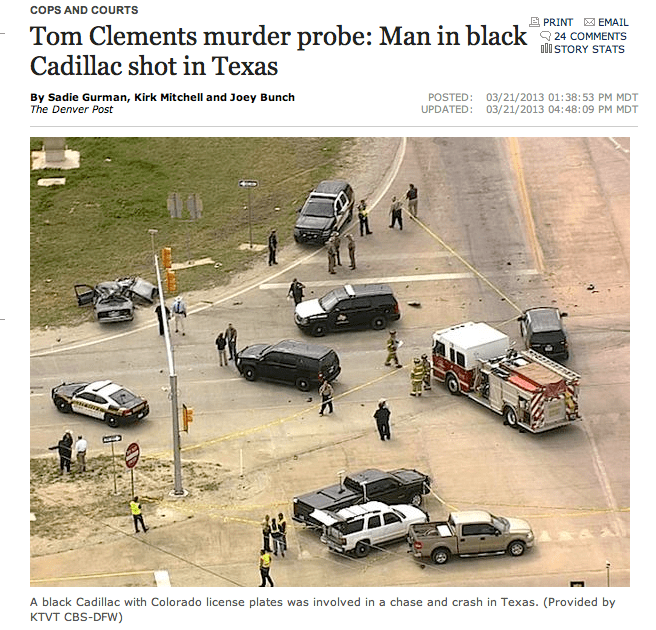 Apparently some random dude in a black Cadillac with two different Colorado tags, involved in a Texas car chase and shootout today, may be a suspect in the shooting. After the suspect’s vehicle was hit by an 18-wheel tractor trailer, he managed to get out of the wreck, guns ablazing. The suspect has not been identified…because his identity has not been scrubbed from the internet yet. One of the witnesses that police had been looking for, the speedwalker, was found. She said she did not see the car that was allegedly seen in Clements’ neighborhood before the shooting. 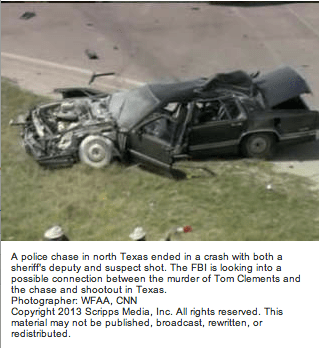 My question – who saw the speed walker and did they see this alleged car? 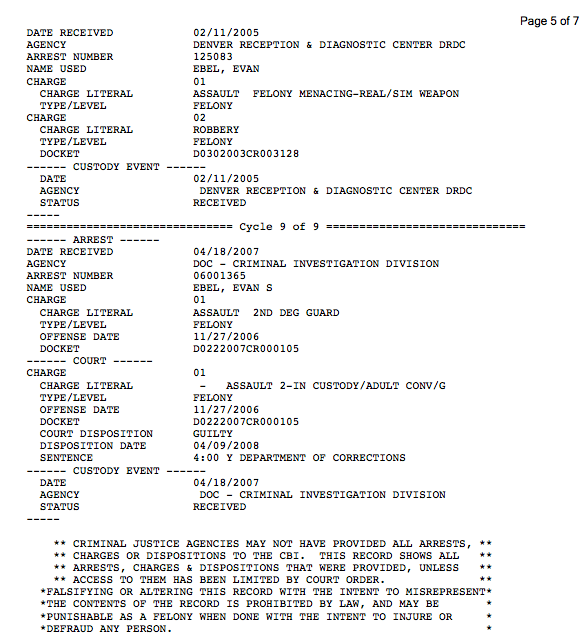 And the Denver Westword asks the question, “Assassination?” For full Westword story go here. Not sure if you’ve seen this yet, its pretty ridiculous, James converts to Islam in prison as a way to justify the murders as his own personal jihad. what about the saudi man that has been the alleged suspect according to fox and cnn for 2 days??? where did he disappear to?? also, ‘white supremacist again’? wasn’t the sikh temple guy who lived on HOLMES AVE. also a white supremacist? INTERESTING……………or par for the course!!!!!! i look around at things and i don’t know where i am anymore. just heard they want to change easter to ‘spring egg hunt day’. how about the ‘google glasses’—–glasses also have an embedded camera, microphone, GPS and, reportedly, use bone induction to give you sound— they called them orwellian. scary times were in. LOL! Google glasses…that article was funny…scary…but funny. 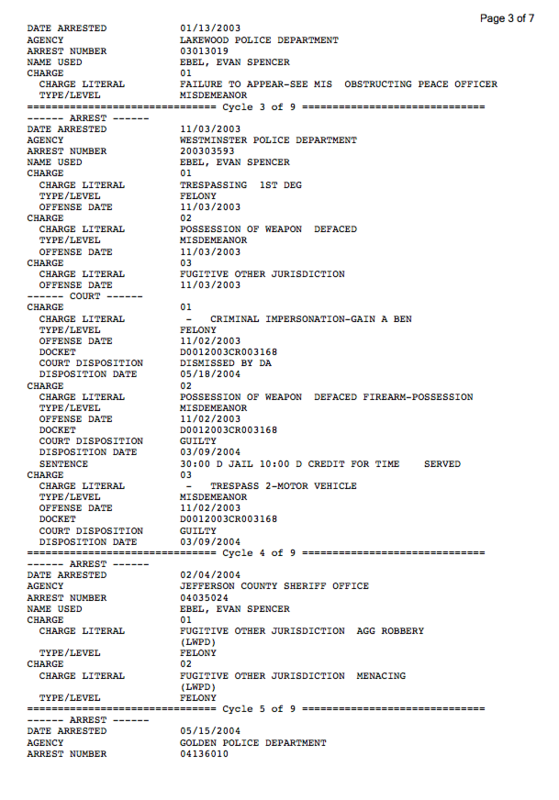 I did find Evan’s criminal history. Just posted. so we don’t know why exactly this guy is the now top suspect..aside from the car. post if you get more info on the connection. mostly though, i’m writing this to thank you for posting the 2 pages of quotes from people who were actually in james’ life. who knew him and could confirm that he wasn’t the loner/monster all of the unnamed sources claim him to be. 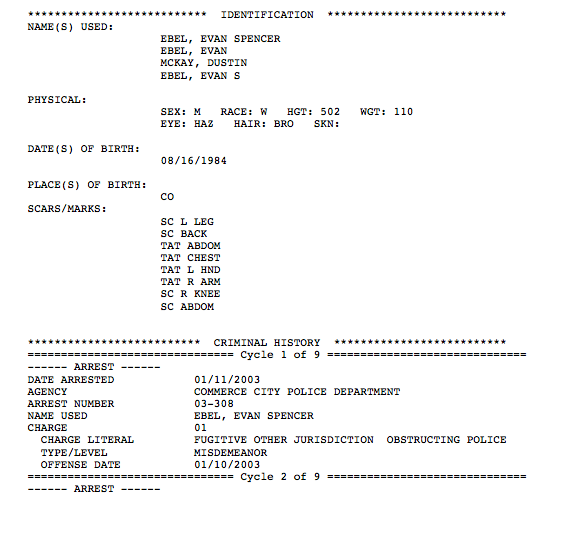 Hi– where did you get the criminal history records? 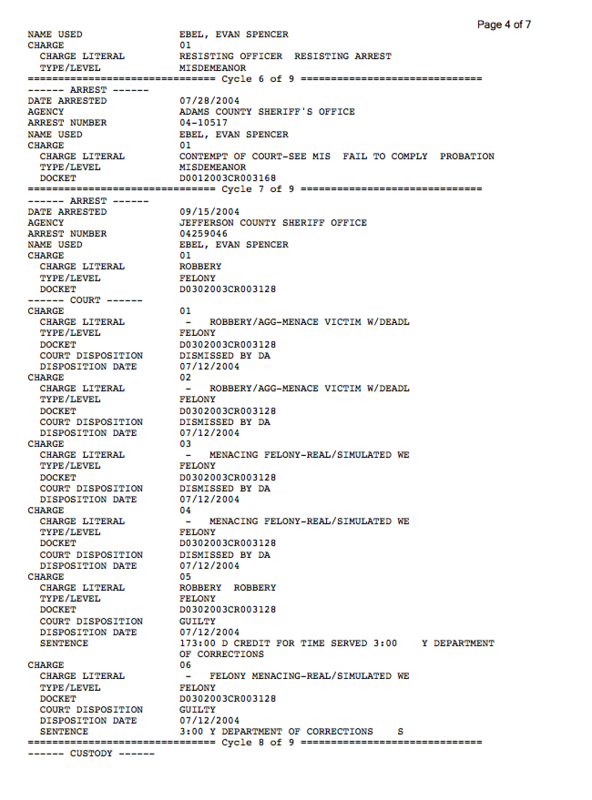 I also searched the Colorado State Judicial Courts website and didn’t pull anything up. Thanks. first off, i love the last sentence in the paragraph next to james’ picture up top. a society that does not think on their own is ripe for a dictator. second, i wanted to send you some links to a few articles you may find interesting. is there an email i can send them to? i receive updates from this site, but i couldn’t find a response address. thanks for all you do.